A nosebleed may be caused by trauma, irritation or dryness of the lining of the nose, allergic rhinitis, colds, or sinusitis. 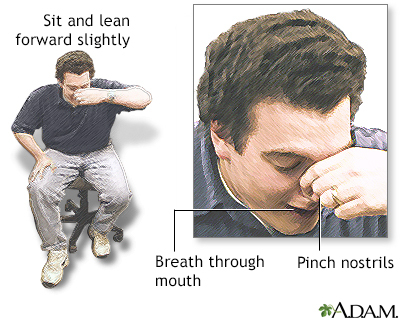 Other causes can include nasal obstruction such as a deviated septum, or foreign objects in the nose. Most nosebleeds begin on the septum, the midline, vertical cartilage that separates the nasal chambers and is lined with fragile blood vessels. This form of nosebleed is not serious and is usually easy to stop. Seek medical help if the bleeding persists after 15 to 20 minutes of treatment, nosebleeds recur, blood persistently drains down the throat, or a neck or serious head injury is suspected.